Ready to get in that Halloween spirit? 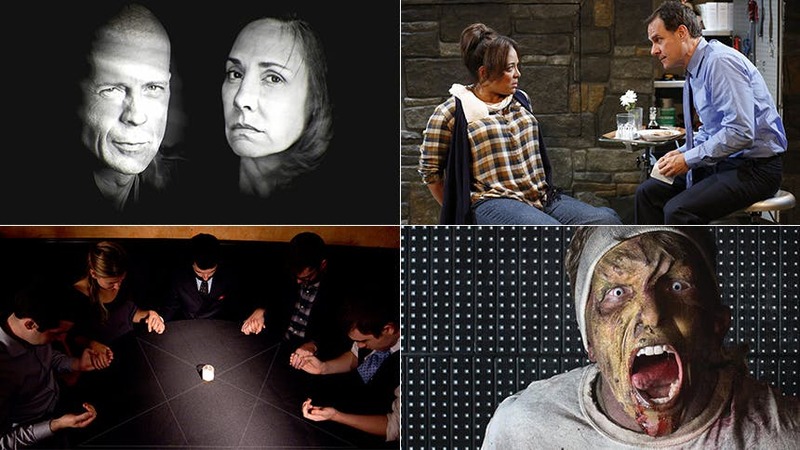 Here are 10 plays, musicals and theatrical events you don't want to miss this October. Zombies + dance party make for a night that’s actually fun but also hits your Halloween checklist. The immersive party is set inside a post-apocalyptic world of zombies and you can choose-your-own-adventure to survive (or just have a blast). Running Tuesday thru Friday at the Medicine Show Theatre. Set in an intimate, round-table setting— not unlike the séances that became wildly popular in the early 20th century— magician and performer Jason Suran takes a 12-person-audience through the dark and fascinating history of the séance, before attempting to cross the border between our world and something... beyond. #ItsGonnaBeTerrifying October 25-31 at the Highlight Studios. Bruce Willis and Laurie Metcalf star in Stephen King’s goosebump-inducing thriller about a deranged fan who tortures her favorite author. Face it, your Halloween in New York isn’t complete unless you’ve seen the kneecap scene live. Broadway’s Broadhurst Theatre. If you’re looking for an actual Halloween party to beat all others, head to The McKittrick Hotel (home of Sleep No More) on October 30 or October 31 for their one-of-a-kind party experience. The evening includes bottomless open bar, live music, and surprise guests DJs. As for costumes, they recommend sticking to the occult theme: a sorcerer, enchanter, beast, fiend, monster or witch, or all in black. Cherry Lane Theatre’s serial killer thriller follows Nancy as she tracks down a serial killer whose deadly poetry she becomes obsessed with until it leads to her becoming his captive. One of Japan’s most enduring horror stories, Yotsuya Ghost Tales, and Macbeth are blended to tell this scary tale of a woman who returns from the dead to wreak vengeance on the ambitious husband who betrayed her.TBG Theatre. A fallen pop star finds herself in hell with some of history’s most notorious, fabulous and evil women. The fast-paced new musical satire runs at The Elektra Theatre through December 27. If you want a quintessential Halloween in New York experience without the scare, hop on The Ride for their glitzy and spellbinding In Masquerade show this October. You’ll see Manhattan anew while feeling like 16th Century royalty behind your bejeweled mask. The classic tale of Ichabod Crane and the headless horseman comes to life in this award-winning musical adaptation at the Players Theatre. The long-running murder mystery Perfect Crime celebrates Halloween with a new lobby exhibit titled Manslaughter: Women Who Kill the Men They Love. It’s free and open to the public through November 6.